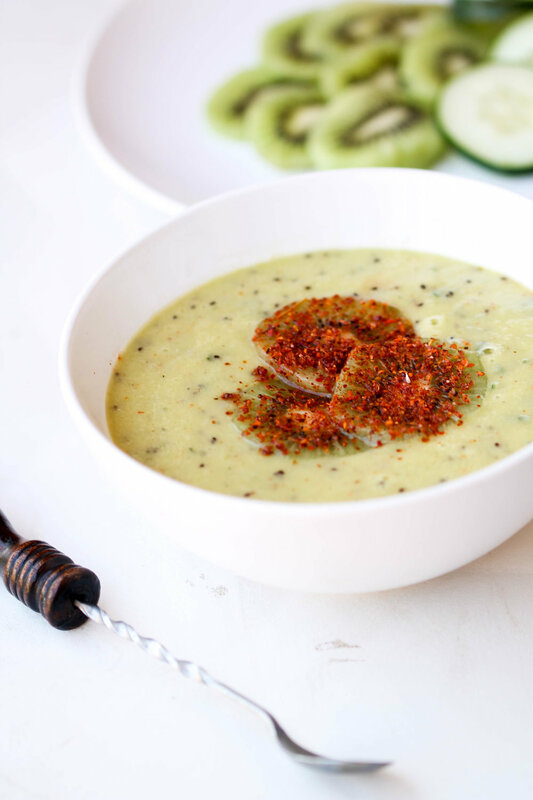 Chilled Kiwi Cucumber Soup : easy, refreshing naturally vegan, gluten-free soup that is ready in 30 minutes or less! My love for chilled soup started with gazpacho & vichyssoise. I was on the fence about eating chilled soup but we instantly bonded after my first spoon. What is not to love about chilled, no-cook, refreshing soup packed with so many nutrients straight out of the bowl. Chilled soup is a sweet situation especially if you have aforementioned problem I am dealing with these days. Also called laziness and unwillingness to mess with the stove when it is 100+ degrees outside. I hope you will join me in diving into Chilled Kiwi Cucumber Soup, which screams all things Summer and delicious. Let's do this friends! I received free samples of Zespri SunGold Kiwifruit, a new variety from Zespri that are a natural cross between gold varieties of kiwifruit. I was pleasantly surprised with Sungold Kiwifruit - first of all, it is yellow on the inside with a smooth, hairless skin on the outside. I found them to be lot more softer, juicier, and sweeter than the green kiwifruit that I am familiar with. Usually, I enjoy my fruits straight up or in the form of fruit salad. With Sunfruit kiwi because of it's softer texture, I took the chilled soup route inspired by gazpacho. It works you guys! It feels like you are sitting at a spa...and getting major detox treatment - hello hydrating cucumber, tangy tajin spice, and delicious kiwis. On a side note: If eating fruits is a struggle, I suggest you run to the nearest Mexican store and pick up tajin spice asap - it goes so well with tropical fruits. Also --> 5 Ways to Eat More Fruits & Veggies! Did you know that one serving (2 kiwifruit) of SunGold provides three times more vitamin C than an orange and as much potassium as a medium banana. It is a good source of antioxidant vitamin E.
You can use both green and Sungold kiwifruit as a meat tenderizer. They have an enzyme called actinidin that helps break down the protein to improve the digestion as well as serve as a meat tenderizer. 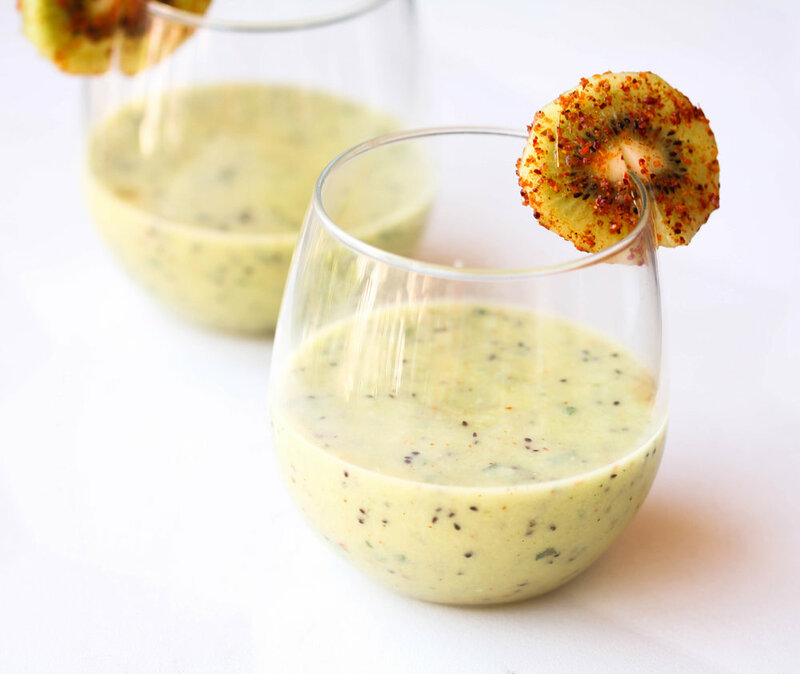 Simply peel and mash a kiwifruit and spread over meat or make a kiwifruit marinade. In a blender, combine kiwi, cucumber, garlic, and 1 teaspoon tajin seasoning. Pour olive oil slowly and puree everything together. Season with salt, pepper, and more tajin seasoning as needed. Allow it to chill in the refrigerator for at least 30 minutes before serving.